Jonathan Rosenbaum and I caught a screening of the documentary Room 237 in Toronto, but we had to dash off to separate engagements soon after, and didn’t get a chance to talk about it. I found the film fascinating but troubling. The next day I discovered that he had put up a post that spoke to some of my concerns. I highly recommend reading it. As is now well known, the subject of Rodney Ascher’s Room 237 is Stanley Kubrick’s The Shining (1980). It gathers a half-dozen people obsessed with the film, and interweaves their analyses and commentaries. They propose many theories: The Shining is about the Holocaust; or the genocide of American Indians; or a faked moon landing engineered by Kubrick; or the “impossible architecture” of the Overlook Hotel; and so on. Ascher himself never intervenes to pass any kind of judgment on which of these theories is ingenious or plausible or unlikely or ridiculous. Here’s what disconcerts me about the movie: It is a disturbing representation of the practice of film criticism. 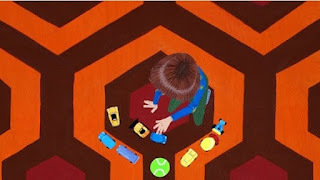 Not only do the commentators in Room 237 advance theories about The Shining; they use techniques of close analysis; and they offer “readings” by drawing upon evidence from the film. So, what is wrong with this detailed depiction of film criticism in action? And what is the relationship between the practice of film analysis depicted in the film and “good” film analysis, by which I mean the kind of film analysis we as critics want to convince the public is worthy? Spotting hidden references to the Holocaust or to the genocide of Native Americans is not in itself a critically or politically reflective activity. The Shining (while being a wonderful film, for many reasons) simply does not engage with these weighty historical traumas. It is not “about” them in any meaningful way. And neither does it have to be in order to be a great film. But when Room 237 represents film analysis in a manner that treats it as little more than a clever puzzle-solving exercise, it gives no hint as to the social value and political/aesthetic worth of this public activity. It never intuits what is truly at stake in the activity of paying close, analytical attention to films. The movie makes one radical suggestion: viewing The Shining simultaneously on two screens, one projected forwards and the other backwards. A brief and striking commentary follows on a few uncanny correspondences and deeply evocative juxtapositions that result. I’m captivated by this experiment because, for once, it pulls The Shining away from Kubrick’s intentionality into a larger realm of accident, chance and poetry that radiates outward into the world from the sealed inner space of a game. What is a “theory”? One could say: a theory is an account of how something works. Every field of study has its theories. For example, three important theories in physics are Newton’s gravitational law, relativity, and the “Big Bang”. This is the sense in which we are using the word when we discuss Room 237. But there is another sense in which the word has been used in the humanities in the last few decades: let’s call it capital-T “Theory,” a large umbrella that includes feminism, Marxism, psychoanalysis, structuralism, post-structrualism, queer theory, post-colonialism, and more. “Theory” in this sense is a kind of speculative thinking that is broad-ranging (meaning: its effects have been felt across multiple disciplines) and, crucially, it is a political and critical activity. “Theory” in this sense is motivated by an impulse to question “common sense” and “the natural,” note inequalities and injustices, unmask relations of power, show how ideology works -- basically, to critique our world in some way. Beginning in the days of Goethe and Macaulay and Carlyle and Emerson, a new kind of writing has developed which is neither the evaluation of relative merits of literary productions, nor intellectual history, nor moral philosophy, nor social prophecy, but all of these mingled together in a new genre. In Room 237, we have several “theories” to account for the film but what I miss is any whiff of “Theory,” in however casual or informal or un-academic a form. -- I was honored to be asked to join the editorial advisory board of REFRAME, edited by the indefatigable Catherine Grant. At the blog for REFRAME, Catherine has launched a new feature, a "weekly roundup of international news and links in media, film and music research." At Film Studies for Free, she rounds up the new issue of Jump Cut and pays tribute to recently deceased filmmaker Octavio Getino, who helped create both the theory and the practice of "Third Cinema". Also, via Catherine: Pedro Almodóvar on the Spain protests. -- Danny Kasman interviews Brian De Palma at MUBI. -- A 1971 interview with Jean Eustache translated by Ted Fendt at MUBI. -- Jonathan Rosenbaum: "Nazis are fun! Jesus is fun! Arthurian legends are fun! Third world countries are fun! Caves are fun! The Holy Grail is fun! Lots of snakes and rats and skeletons are fun! Chases are fun! Narrow escapes are fun! Explosions are fun! Indiana Jones is fun! Indiana Jones’s father is fun! Put them all together and you get the third panel in Steven Spielberg and George Lucas’s Indiana Jones triptych..."
-- In a few weeks I'm driving down to the University of Pittsburgh to attend the Cinephilia/Cinephobia conference. -- New issues of La Furia Umana and Desistfilm; the latter includes a page that collects Top 50 lists from the members of the editorial board. -- Recent additions at Hulu+ include (all in HD): Rossellini's India: Matri Bhumi, Stromboli, L'Amore and Voyage to Italy; Oshima's Boy; Ozu's The Flavor of Green Tea over Rice, Brothers and Sisters of the Toda Family and Walk Cheerfully; and Rivette's Le Coup du Berger. -- Why is it that films, more than other art-forms like literature, need explicit patterning, repetition of action, and restatement? See David Bordwell's interesting post, which calls upon Hong Sang-soo's In Another Country. Also: David on the long take. -- Adrian Martin on images of "hand-holding" in movies: "The recent explosion of Internet-based film analyses — using screenshots, short clips, audio samples, gifs, image-collages, and much else — has been training us to notice what, once upon a time, we might never have noticed in movies." Also: Adrian on the best Australian film of 2012. -- The blog Godard Montage accompanies the graduate seminar “Jean-Luc Godard: Art/Politics/Theory” taught by Sam Ishii-Gonzales at The New School. -- Eric Rentschler at Artforum on the 50th anniversary of the Oberhausen Manifesto. -- This recently held conference on the films of Werner Schroeter at Boston University has me looking me forward to the retrospective of his films in Toronto next month. -- Michael Sicinski's coverage of TIFF. -- Several tributes to the late Tom Milne are collected here. -- This sounds fascinating: a series in Toronto called "Indian Expressionism" featuring Josef von Sternberg, V. Shantaram, Fritz Lang, Kamal Amrohi and Franz Osten, curated by Meenakshi Shedde. -- Mark Rappaport on "the double life of Paul Henreid". -- David Davidson translates three early Cahiers pieces by Serge Daney on Mark Donskoy, Douglas Sirk and Jerry Lewis. Laurent Kretzschmar comments at his blog Serge Daney in English. -- Cinema Guild is releasing three good Sokurov films: Whispering Pages, Stone, and Save and Protect. Also, their Twitter page hints that the work of British artist/filmmaker Ben Rivers may finally be appearing on DVD. Here's a Dennis Lim article on Rivers in the NYT. -- The AV Club has released its list of top 50 films of the '90s. The dominance of English-language films on this list is appalling. "Ascher himself never intervenes to pass any kind of judgment on which of these theories is ingenious or plausible or unlikely or ridiculous." This, I believe, is not true. Ascher often juxtaposes footage from The Shining to comment upon what was just said. I specifically remember a shot of Torrence at the bar doing something (running his hands over his face, or grinning like a maniac) in direct response to what was just said on the audio track -- not as evidence for what was said, but as an editorial reaction on the part of the documentary's filmmaker. Thanks for this, Danny! I've seen the film just once, and need to see it again to see small, subtle details like the one you point out. In general, I felt that Ascher chose not to evaluate or critique any of the theories in any kind of sustained way. It felt like a very conscious choice to me: as if he had said, we are just going place all these accounts next to each other (postmodernist fashion) on an equal plane, and not engage in passing judgement on them individually. This was my overall impression. But perhaps a second viewing will modify that impression. Loved that De Palma interview, by the way. What a fun read. I think you are fundamentally right, in that he serves a purpose of providing enough evidence to make their critiques not unfounded. His editorializing struck me more as a tonal reaction than a critique of a critique. Thanks, about the De Palma -- I'm really looking forward to your expanded thoughts on that fiml! Thanks, Danny. I had fun chatting with you about the De Palma over dinner! not particularly fond of horror movies and so i will not comment on the Shining and whether Room 237 is a worthwhile project of criticism or not but Girish your few lines on "Theory" are good. Great post, Girish. I've not seen Room 237 yet, but your description of it reminds me that I've been meaning for a while to write something light on the close-analysis-as-conspiracy-spotting school of analysis. I'm thinking especially of the frankly mind-boggling (and, unfortunately, now mind-bogglingly common) practice of spotting arcane and archaic "Illuminati" symbolism in popular culture, which seems so popular online these days. I find I want to yell at them and tell them to put that close textual analysis to productive use! It's also similarly entirely apolitical, of course, despite the delusions of grandeur of those who practice it. I'm sure there's nothing so bad as this in Room 237, but it's ringing comparable alarm bells in me - that whole simplistic 'hidden messages' conception of analysis (an impulse from which mainstream film theory isn't necessarily immune either, incidentally!). Great post, like always, Girish! Thanks for the shout-out. Such a thoughtful entry, Girish. Very much enjoyed your writing here. It conjures, for me, the way that an essential meaning of a work is displaced by metaphor. I recently had an opportunity to listen to cognitive psychologist Steven Pinker deliver a lecture on the diminishment of violence in contemporary times, which elicited considerable disbelief from his audience who challenged him during his Q&A. After providing statistical evidence that reported a decrease in physical violence, one thoughtful audience member queried after the possibility that violence has transformed into indirect influences: such as corporations strongarming governments into policies that negatively impact their constituencies. I was intrigued by Pinker stressing that--as questionable as these activities might be--they are not violence. They are metaphors of violence, which are not the same thing. In some ways, the way you describe this film and the various interpretations of The Shining, the various ways the film has been applied to suit this or that particular theory, strikes me as parallel. I can't help feeling that both you and Rosenbaum may be missing a crucial point in your rush to judge the film. If you find the film's uncritical presentation of its "theorists" unsettling, I suspect that may be Ascher's intention. For me, the film is about the seduction of a delirium of interpretation. The juxtaposition of plausible interpretations that take history and politics into account (such as the Native American genocide allegory) with ones that are frankly batshit (like the moon landing confession) suggests the dangers of getting lost in such a delirium and confusing it with real criticism. I too thought of those Illuminati videos that proliferate on YouTube. Ascher allows us to get seduced by his subjects - unlike Rosenbaum, I don't think he's mocking them - but ultimately, he backs away from endorsing the kind of criticism he depicts, leaving it up to the spectator to judge whether there's any real empowerment in the obsessive uses of video technology made by his subjects. One other point: the film never addresses the supposed "death of the author" and all its subjects think that Kubrick must be personally responsible for the hidden messages they think they've found in THE SHINING. Yet I can't think of a better example of the rise of the critic and his/her interpretations. In this way, I think Theory sneaks in through the film's back door, albeit maybe in a distorted form. That AV Club list? Appalling but not surprising. My special proof password is "fookedEC". Steve, I like your take on "the seduction of a delirium of interpretation". What disconcerts me about the movie is the uncomfortable resemblance of the activity performed in it to what we film critics do. Nowhere are the interviewees referred to as "critics" but in point of fact, all their actions (close analysis, putting forward theories, performing readings, mounting arguments) are actions performed by critics. Which immediately, for me as a film critic, leads to questions of value: What parts of this film are "good" film criticism? And what parts of it are not? And why? Since criticism itself is always and inescapably about making value judgments, and this is a film about critics, I find it odd that it chooses not to concern itself with these questions. My bigger issue with the movie has to with "representation". Speaking from a very personal standpoint, it's not often that a movie comes along that takes as its subject an activity that I'm deeply passionate about. But when it focuses on critics/analysts who practice mostly what I think is dubious or even "bad" film criticism, I'm chagrined that it will portray this activity to the public in a freakish, ungenerous light. I guess I'm reminded of CINEMANIA (although ROOM 237 is a much better movie), which depicts extreme, ridiculous cases of cinephilia, leaving the public with the impression that perhaps this is what most cinephilia and cinephiles are "really" like -- which surely distorts and caricatures cinephile culture. I guess one point of comparison might be feminist outrage at the narrow range of types of women portrayed by Hollywood films. When mainstream filmic representations focus on a narrow range of women (young, attractive, functioning as objects of romance or sexual desire, with little dramatic attention paid to their working lives), it shortchanges the sheer variety and diversity of "real" women in society. Instead, what we get is a caricature of women as a group. Similarly, what we get in ROOM 237 is often a kind of caricature of the activity of film analysis and criticism, and this troubles me. I haven't seen the film so I can't comment on it particularly, but your post raises some very interesting questions, the main one being: what separates criticism from interpretational delirium? Or better yet, what makes good criticism separate from bad? I suspect it's a deceptively simple question, but it's one I've been struggling with for a while. Not just with criticism, I hasten to add, but the humanities in general: what makes a particular work (idea, concept...) better than another? A few criteria spring to mind immediately: internal consistency; how much light it throws on its subject; how well it fits in with what is already known. But these are pretty hard to quantify, or to ascertain objectively. For example, you name Theory as a political activity, yet the Holocaust and the genocide of Native Americans are both politically loaded themes; uncovering the presence of such themes in a film certainly seems like a critical activity. So what separates these theories (with which I don't concur, by the way; in fact, I suspect that one of the things that will make me uneasy when watching the film is how easily an interpretation can be taken to the extreme and made convincing at the same time. But that is not the issue) from other readings of The Shining? Your distinction between theory and Theory doesn't quite suffice for me, in part I think because you've been vague enough with your definition of Theory so that it can even embrace the activity you initially condemn! Thanks, Nathan! You raise very good (and thorny) points! "For example, you name Theory as a political activity, yet the Holocaust and the genocide of Native Americans are both politically loaded themes; uncovering the presence of such themes in a film certainly seems like a critical activity." A-ha! Yes, it does seem that way, but what I'm trying to argue in the post and comments is that mere uncovering of references to the Holocaust or the Native American genocide (because they are clues planted by a genius-puzzle-designer film director) does not, for me, count as a significant critical or political activity. I think one must go much further for the activity to go from puzzle-solving to something genuinely critical and political. How exactly does the film engage with the Holocaust? How deeply is this theme woven into the narrative, the form, the development, the mise-en-scene of the film? IMO, it is answers to questions such as these which will tell us how "good" these proposed critical readings are. Shall ponder this, and return with a couple of more thoughts tomorrow...! The questions of value raised (and not overtly answered) by the film are ones we always have to ask ourselves, even when reading "legitimate" criticism. I can see your point about ROOM 237 as a negative representation of criticism, but I don't really see it as a depiction of film critics. Its subjects' actions resemble criticism, but in their obsessiveness and conviction that there are deliberately planted hidden messages in THE SHINING to be dug out, they seem closer to conspiracy theory blogs or people analyzing Jay-Z videos for signs that he's a tool of the Illuminati. I would like to post as a Jay-Z fan, a rap critic, and also a cinephile, screenwriter, and amateur movie critic. I haven't seen the film yet, but I'd like to point out that Kubrick has been the hot topic of many esoteric and fringe researchers in recent years. It seems like his movies are filled with esoteric and religious allusions and do in fact pose themselves to be analyzed as if a puzzlemaster planted subtle clues throughout. I know this kind of analysis can seem immature, but then again not really if for instance you think about Magnolia and all the allusions to the number 8 and 2 which reference the Exodus passage 8:2 which is about the rain of frogs. Filmmakers do put things in films to create a sense of reality and we can never be sure what they really intended but the fact remains that it was recorded and shown. I would argue that some of my favorite films are good because they capture the scenery of New York streets in the 80's, and they help preserve a certain aesthetic of that time that no longer exists. Yet, I am only referring to the scenery in the background such as the passersby or the cars which may not have any narrative relevance. There can then be an anthropological meaning to the films thus a discourse worth discussing. But back to Kubrick. I too have come across the theories of The Shining being an apology for the fake moon landings. I understand this interpretation is outlandish and I don't adopt it. But I will defend its right to be expressed and spoken on. This is the meaning of the movies, to come out of a screening (which is like a vision) and make up your own story of what you witnessed. I understand how in academic circles you have to make sense, or you have to contextualize your interpretation. But I think there is a place for playful and poetic interpretations. After all, I think we know very little still of what cinema actually is and how it relates to vision. What are we actually watching? Our own memories being reshaped and reconnected? That's biological territory ... but it speaks about the nature of visual reasoning and how meaning exists at different levels depending on the individual and the dots that he connects. Nathan and Hugo, I'm running between sessions at a conference this weekend, but will be sure to add some thoughts here when I get a breather soon--within the next day or two. Thanks again for your own. Did anyone say Jean Douchet, Serge Daney, and Brian de Palma? That is absolutely great, David! But btw you've missed an earlier essential piece, Pascal Kané's “Note sur le cinema de Brian de Palma”, Cahiers du cinéma no. 277 June 1977. I have often quoted this for its formulation of the role of the Other/Monster in De P, very subtle and useful. Adrian, Thanks for that! Browsing through the 'table of contents', you can easily miss things like that. I will have to seek it out! Thanks, David. I think you mistakenly posted the wrong link above: here is the correct one to your post. Hugo, Nathan, apologies for forgetting completely about my promise to reply to your stimulating comments! Here are a few belated thoughts. Hugo, I absolutely agree with you that there should be "a place for playful and poetic interpretations". The idea of imaginative, "crazy" interpretations is actually one that appeals to me enormously. In a similar spirit, I also enjoy Surrealist games (such as the "irrational enlargement" of THE SHANGHAI GESTURE in Paul Hammond's collection THE SHADOW AND ITS SHADOW). But I become suspicious when interpretations of films tie themselves EXCESSIVELY to directorial intention. Which is what happens in ROOM 237. The auteur becomes a kind of high-IQ demiurge and the critical activity a sort of "divining" of the grand master's ingeniously concealed intentions. This kind of "criticism as puzzle-solving" leaves me cold. But big-T "Theory" is a historically specific phenomenon that was born in the 1960s in the humanities academy in the West and was very consciously motivated by political concerns and a desire to do political critique. Now, does ALL good film criticism need to be driven by "Theory"? Of course not. We can think of all the great film criticism produced from the birth of the medium until the 1960s or so -- and even continues to be produced today outside the orbit of "Theory"'s influence.